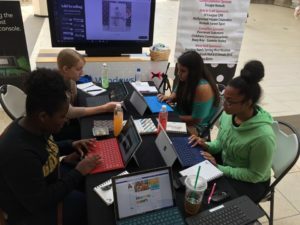 The goal of the summer camp is to expose 8th & 9th grade girls to the opportunities that the business world holds as well as the processes involved with running a business. -Explore their talents with other like-minded girls. -Gain business and entrepreneurial skills. -Participate in giving back to their community. All monies earned will go to a charity that the girls select. 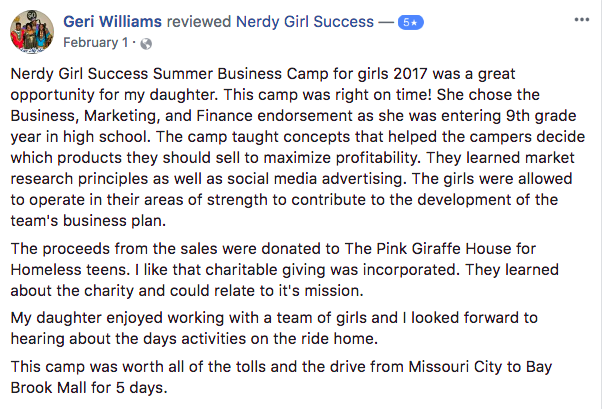 Last year, our camp last year was able to donate $585 to The Pink Giraffe House. Day 1: Laying the groundwork. What is the business and what sets us apart? Who is your customer and who is the competition? What are our budgets? Day 2: Behind the scenes operations. Graphics and crafting our message and sales pitch. The girls craft their messages for their ads as well as their sales pitch. Day 3: Advertising and Marketing. What’s the difference and what do you have to consider for each? The girls will be setting up their social media marketing and advertising. Day 4: It’s all about the money! As Marcus Lemonis says, “If you don’t know your numbers, you don’t know your business.” We’ll be determining our pricing, expenses, operational costs, breakeven points, and more. The girls will be learning the numbers of business and determining their sales goals and how they will know their break even point as well as profit margins. Day 5: Show time! The girls will run their business and assess how they did. 100% of the money made is donated to charity the girls select. Registration is limited to 10 girls so don’t delay in getting your daughter enrolled today!